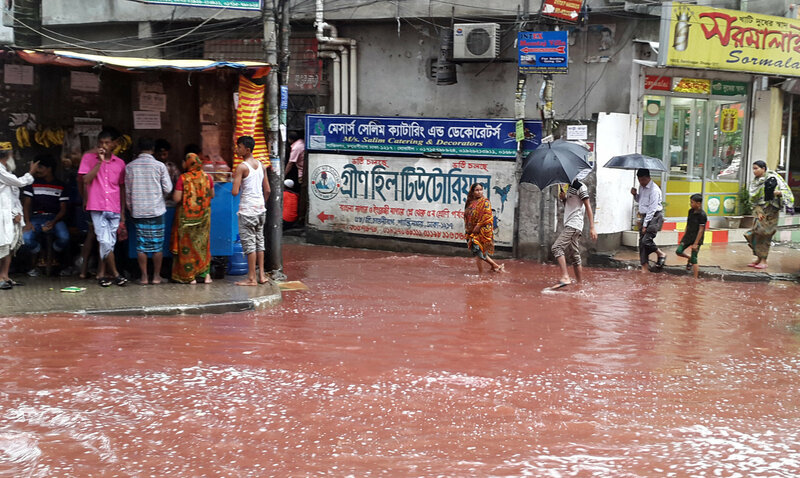 In wake of animal sacrifices to commemorate the Muslim Eid al-Adha, or Sacrifice Feast day, heavy rainfall combined with animal remains filled the streets of Dhaka with literal rivers of blood. Authorities of the Bangladeshi capital detailed hundreds of locations in which sacrifices could take place, to facilitate easy cleaning. But many Muslim city residents made sacrifices on their property, in their garages, or on the street. As a result, by Tuesday morning, streets were filled with a mixture of blood, animal parts, and rainwater runoff. By Wednesday morning the rains had eased and the blood-tainted waters flowing through the streets had ended, leaving a reddish tinge to the pavement and animal entrails strewn throughout neighborhoods.